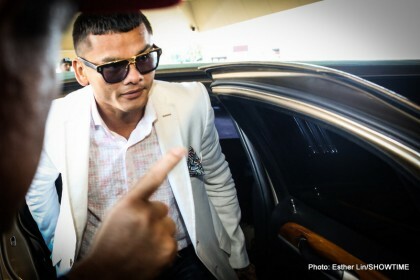 The last time we saw Marcos Maidana in a fight, he was losing his money-spinner of a return meeting with Floyd Mayweather Junior in September of 2014. The next time we saw him after that, in a photo that was widely viewed on the internet, Maidana was carrying plenty of excess weight and had seemingly been enjoying the money he earned in his two big fights with “Money.” it seemed we had seen the ferocious Argentine warrior’s last fight. But now, in speaking with RingTV.com, Mikey Garcia – himself having a comeback of his own – says he has a feeling Maidana may embark on a ring return some time in the future. Garcia, Ring reports, has been sparring with Maidana’s younger brother Fabian, and he says “El Chino” has expressed interest in returning to the Robert Garcia Boxing Academy to both help his brother and work out and lose some of that excess weight he picked up last year. A Maidana return would of course be welcomed by the fans. Never in a bad fight, win or lose, Maidana was relentless in the ring, a big puncher with a fine chin and a superb work-rate. But can the 33-year-old who amassed, from the two Mayweather fights alone, more than enough money to live comfortably on, possibly get the hunger back? Money, and the need to earn it, is of course a big motivational factor in boxing, or it can be. Maybe Maidana, a man who was simply born to fight, will indeed get the urge back if and when he puts the gloves back and sees some of his old fitness return. Or maybe Maidana will be reminded of how hard it was for him to make weight, something he never liked having to do. A successful return at anything above welterweight would be a big ask, but would Maidana ever be able to get down to 147-pounds again? If he can, and if he launched a return next year, Maidana, 35-5(31), with his big name, would have no trouble getting himself a big fight or two. 33/34 isn’t that old for a welterweight and maybe Maidana is wondering whether or not he can get the old fire back in his belly. You are here: Home / Boxing News / Marcos Maidana thinking possible comeback?